"In Asia and the Pacific, HIV programming for MSM and transgender people continues to be guided by principles that are morally endorsed." Studies have shown that, in spite of some improvements, current HIV programming for MSM and transgender people is largely failing to reach universal access (UA) targets for these populations. In Asia and the Pacific region, national HIV programming in many low- and middle-income countries continues to exclude or marginalize MSM and transgender people, whereas HIV programmes that do provide services are limited in scale and scope to address the growing number of MSM and transgender people in need. This disparity between clear need and actual programming for these populations has proven detrimental in many countries, where the failure of HIV programmes to provide essential HIV services has created a ‘perfect storm’ for the rapidly rising epidemics. The scoping paper, accordingly, aims to investigate such a disparity. In doing so, the paper: (1) looks critically and strategically at the current landscape of MSM and transgender programming in Asia and the Pacific; (2) identifies and analyzse the key assumptions which lie behind the core principles underpinning HIV programming for MSM and transgender in the region; and (3) provides recommendations on other assumptions that are not yet studied and could have potential positive outcomes at the programming level. 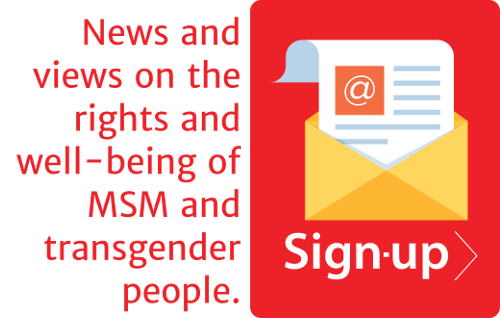 APCOM also develops a tool based on the identified principles and underlying principles to help organisation that works with MSM and transgender individuals to find out if they inadvertently reinforcing hierarchies and unhelpful power dynamics, and to discover their key advocacy areas to pursue, in relation to the practice and principles of working with MSM and transgender people.